Frequent breaks can help minimize work related stress and improve their overall productivity. According to an online survey conducted by Staples in March 2014, employees who left their desks to take breaks experienced less stress and higher levels of work efficiency. There was also a direct correlation between regular breaks and workplace happiness and satisfaction. More than 85 percent of the 200 respondents noted that taking regular breaks would make them more productive. More than 25 percent of the respondents stated that they take only one break throughout the day – lunch. Why only one break? Many employees either felt guilty or believed that could not stop working in order to take a break. 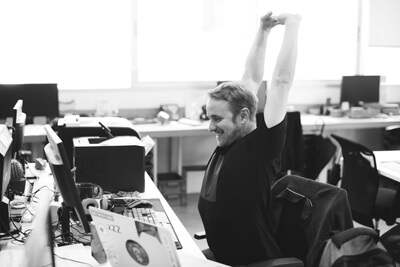 Fifty nine percent of employees would feel happier if they had regular work breaks while 37% offered that they would benefit via a boost in their health. Check out the infographic below for more details.